Hello! 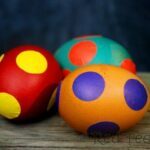 Today, I share with you a very special Easter Craft Ideas round up. It is a collection of Easter Crafts from two of my “communities”. One is the very new G+ Arts & Crafts Community (all welcome, just request and invite) and the other is our Craft Chat group on Facebook (again, just request an invite). 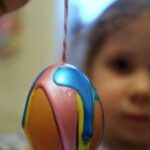 I challenged the communities to come up with an Easter Craft and here I am sharing them with you today! Love this no sew Easter Puppet. Totally adorable and so takes me back to my childhood, when I remember making a girl puppet but with a clay head. I reckon this bunny is by far superior (and not difficult to make at all). Molly Moo shares her fantastic craft! 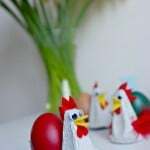 Now here is a brillaint idea – DIY seed bombs, using egg shells. Fantastic. We made some Egg Shell Candles last year, that you may also like, but instead of filling the egg with candle wax, fill it with seeds as Me and My Shadow shows us. Fantastic idea and a great “alternative” Easter gift. Well.. I HAVE to say that I love these, as we did similar ones from Newspaper Easter Bonnet last year. And I do indeed love them (in fact the ones we did last year, where another of my most favourite Easter Crafts ever). But I also have to say that Zing Zing Tree’s tissue paper one is simply so beautiful and stylish! A lovely little “how to”, showing you how to fold your very own Easter basket by Knitted Mummy. Then the kids get to decorate it to their heart’s content? Would make adorable little party favour bags too! Some adorable Easter Bunny Ears from the kids at Naturally Educational. Love the ears themselves and adore all the adorable decorations. Perfect. Wonderful bunny handprints from The Gingerbread House – not only are they cute and “topical”, but I think they would make wonderful little keepsakes too! 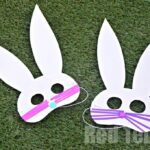 More bunny cuteness with super quick little Pipecleaner Bunny Craft from Domestic Goddesque. I can imagine a whole range of bunny mobiles and garlands or Easter cards made from these! 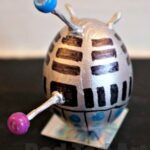 Well.. this is “our entry” to the Easter Craft challenge – as the challenger, surely, I am allowed to take part too?! We made bunny PomPoms using rectangular pieces of card to make “winding” easier. Red Ted (almost 5yrs) loved making them and Pip Squeak (just 3yrs) loves playing with them! 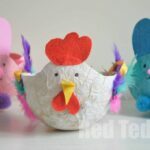 Over at Thinly Spread they have been making Easter Chicks. I love how these are constructed and are able to stand by themselves. Super sweet. Yes yes yes, we have some TP Roll crafts coming our way with these little bunny and chick egg cups. Perfect Easter craft I say – especially as our TP Rolls are now made more narrowly (can you believe it?! Tut tut), but it does make them perfect for holding eggs! These are shared by Jennifer’s Little World. Mmmh and the kids over at Plus2.4 made some yummy looking Simmel Cookies. I have never made these before and I think it is about time to add them to our baking list! We did however make some Spring Cookie pops. As mentioned previously, my kids are convinced that cookies on a stick TASTE BETTER than not on a stick. There you go. There is just something about a cookie pop that is fun! And they really are just as easy to make as normal cookies! More Flower Cookies from Here Come The Girls. Ok so these are a little less simple, but they are TASTY! 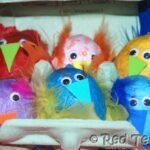 And to round it all off.. one of my favourite crafts for years gone by our Tissue Paper Chicks! 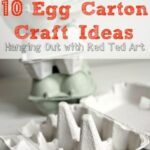 Which is also appearing in Red Ted Art, 60 Cute & Easy Crafts for Kids – my very first craft book out in March 2013 and published by Square Peg! Do pre-order your copy now! I think this would make a wonderful gift at Mother’s Day or for Easter – lots of crafts to keep you busy all year round! WOW Maggy!! thanks for the feature, really thrilled. Wonderful selection of different crafts – I’ve got a Simmel Cake recipe but never seen cookies will have to have a try at them this year… and the tissue paper chicks are gorgeous can’t wait to see the book either. The simmel cookies sound lovely, I do love the cake so maybe I should give these a try. Oh, and i’m counting down the days til your book’s out! Thanks for featuring the Simnel cookies Maggy.It’s great to see so many great ideas from people. My pleasure, great to have such a mix of people join in! Great round up! Can’t believe it’s Easter soon!! Already?! Lent has started.. so I guess yes.. Easter is soon! 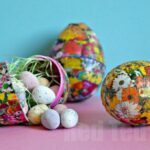 I’m looking forward to easter crafting – I love the colours at Easter – so pretty!